A Little Knitting Trompe l’oeil. TGIF. While I am not doing more, the time I have to do it in seems to have shortened. I don’t understand why 24 hours does not seem like 24 hours anymore but that’s the way it’s been around here. Water is still on the basement floor, not from the washing machine, but the monsoon rain. The sump pump is working. It’s a sensitive object. The smallest things upset it and it stops working. When its quiet for a while, I open the cellar door, remind it that it’s a nice sump pump, and nice sump pumps always pump water. It chokes and gurgles to life and I go about my work until I don’t hear it again. Yarn Rascal has relapsed into deviant behavior. Ripping out grouted tile, tearing up rugs, and totally new behavior: stealing circular knitting needles. He likes to tightly clamp the cable part in his mouth and tear around the house like a Ferrari. Even when I catch him, it is pretty near impossible to get him to give up the needles. When he doesn’t want to open his mouth I can’t do it for him. So I’ve resorted to food treats, a piece of cheese (he likes cheddar) or his favorite bacon biscuits as a sort of hostage exchange. The negotiations before the exchange takes place are a bit long, depending on how determined he is to keep the knitting needles. His favorite pair is a 16″ (41 cm) length 5 mm / US 8. Which brings me to the North River Baby Carrier. I am knitting the sleeves in the round on dpns. The sleeves are done in Seed Stitch. Since the Seed Stitch pattern can’t be easily maintained through decreases the same is true with increases. Sleeves need to have a gentle taper that grows wider as it reaches the upper arm. In a moment of delusion hope I thought of working the sleeve from the widest point down since I had spent so much time figuring out the decreases on the hood. It seems, (surprise, surprise), that a hood and its decreases are way different from a sleeve and its decreases. The major distinction being the distance between the decreases. In a row on the hood the distance in stitches between decreases is greater. In a round on a sleeve the distance between decreases is only a stitch or two. The sleeve decreases need to be kept in the middle of the sleeve underneath where a seam would be if I were working them in rows. The decreases with only a stitch or two separating them didn’t look all that great. Back to the main idea, gently tapering to a wider upper arm. Swatching, ripping, swatching, ripping, research, research, swatch and rip some more and finally I learned a few things. There is no way to keep the Seed Stitch pattern completely intact and so I decided to use a little knitting trompe l’oeil. Basically the knitter can use whatever increase is his/her favorite. Mine happens to be the lifted increase. An increase of 1 st on either side of the central marker keeps the disruption at the center of the sleeve underneath where a seam would naturally fall. The only two stitches affected are the immediate ones on either side of the marker. They got the knitting trompe l’oeil treatment when I decided to keep them as the same stitches within the round but alter them on each round. Normally the two stitches would be k1, p1 on one round then change to p1, k1 on the next round. 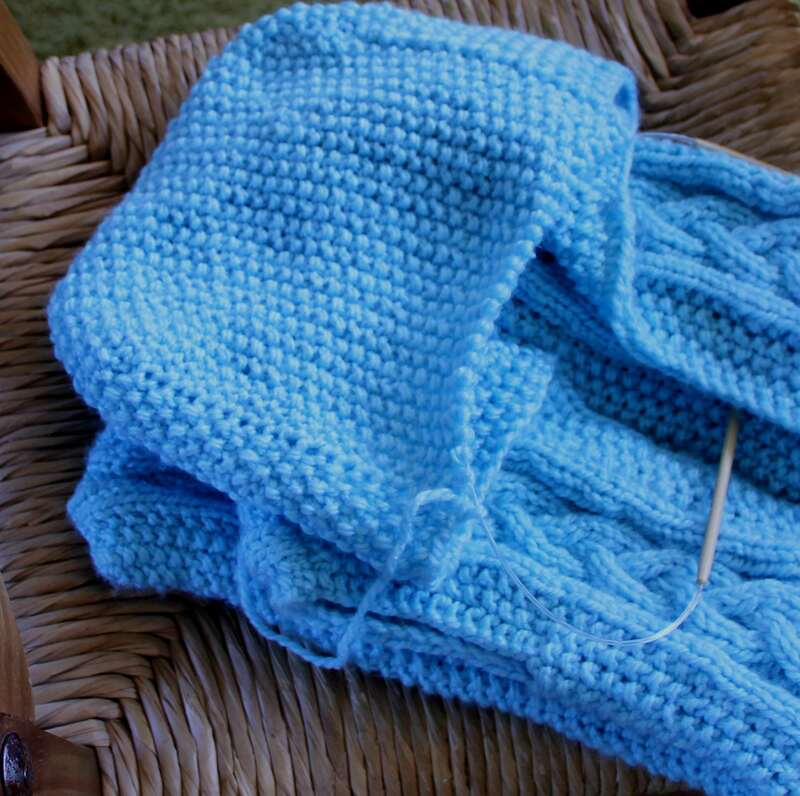 The increases atered that so the two stitches wanted to be the same stitch on each round. On the first round after the increase they wanted to be k2. So I thought let them be k2, on the next round they will be p2, on the one after that they will become k2 again. I was “maintaining” the way Seed Stitch alternates on each row. After working more rows I looked at the effect and the eye cannot see the increase. Neither does it pick up the two stitches that are similar within a round. Because the increases have a large number of rounds between them, there is virtually no disruption of the Seed Stitch pattern either on top or underneath the sleeve. I am planning to have the baby carrier completed by the end of the weekend. Go ahead, laugh. But really, am I not due for a break? I morphed into the mad scientist mode when faced with having to shape and turn the seed stitch hood of the baby carrier while maintaining the seed stitch pattern. Decreasing and maintaining the seed stitch pattern seemed to be diametrically opposed goals. Lots of swatching. Lots of ripping. Lots of angst. Adding to the anxiety, the decreases had to be directional, left leaning and right leaning, to get the hood shape. My basic idea was to turn the hood the way the heel of a sock is turned. But a sock heel is knit in stocking stitch, which easily lends itself to the simple p2tog and ssk decreases. These decreases stand out like a glaring mistake in seed stitch. After researching, more swatching, more ripping I came up with 2 unorthodox decreases that worked in nicely with the seed stitch pattern on a very tiny swatch. The big test was to see if they worked correctly shaping both sides of the 67 stitch hood down to 23 stitches. At this point, my hair looked like I had come through a tornado and I had a persistent tic in my left eye. Anyone with any sense would have taken one look at me and stayed far away. But I live with a human and a dog, neither of which can read the nuanced signs of someone who is coming apart. That’s why I stood in the middle of the living room and announced that I was now sitting down to work on the hood and I couldn’t be disturbed. I paused for a moment to let my left eye tic away for added emphasis. The tic in my eye became more pronounced and I was beginning to get pain in my jaw from clenching it, as I increased my knitting speed and repeatedly asked these two questions of The Skipper: What is that noise? and Where is the dog? The tension built as I continued knitting, the stacked decreases needed little adjustments here and there as they began shaping the hood, the noise continued on and off, Yarn Rascal was MIA, and The Skipper now began discussion about the math and numbers show. PS: Mr. Dragon needs his arm sewn back on. The noise I heard was really two different noises. One was Yarn Rascal. He excavated the tile in the upstairs bathroom again. The second noise was the washing machine draining the water onto the floor. As for the math and numbers program it was something to do with the cosmos. The Skipper yammered on about it while mopping up the wet floor. My knitting mojo is on the wane. I’ve been here before and I know that the best way to handle it, for me, is to continue to knit through it. Between all the things going on that are not knitting related and my work on two big knitting projects and seeing them through to completion without a break in between I’ve come up a bit short in the enthusiasm area. One of the big knitting projects is the baby carrier which I have tentatively named North River Baby Carrier. North River Baby Carrier and my ever present assistant. I have some design issues with the carrier. The issues have to do with this particular grouping of stitch patterns vs. the construction techniques. Notice I’ve literally cut the sleeve out of the armhole on the right. I didn’t like the way it fit before I sewed it in and instead of stopping, like a sane person would do, I went ahead and sewed it in then fretted about whether blocking would iron out the problem. It has been my experience that blocking solves some problems but will not correct a sleeve that simply needs refitting. But, I went ahead and wove in the sleeve ends anyway. I have a phobia about woven in ends. The entire time I weave in an end I am 100% sure it will come undone, the whole project will unravel, the work will be for nought. Think about it: a knitted garment held together by a woven thread. How precarious. Because it seems like such an uncertain way to hold a garment together, I have done more research on weaving in knitted ends than a doctoral candidate conducts on a doctoral thesis. As of this date, I have never had an object unravel from a woven end. My phobia, although baseless, rules. To undo a part of a garment after weaving its ends is an exquisite form of knitting torture. In this instance, I had to take scissors to the sleeve to get most of it off because I couldn’t get the ends undone. I still have about an inch (2.5 cm) yet to separate from the armhole, but that will have to be carefully removed by hand, strand by strand. And that is where I am. Sorting and picking threads one by one. My knitting mojo receding with each chopped strand I tease out. Is it only me, or have other knitters been driven to the edge where sanity crosses over into insanity by Seed Stitch? There must be extant clips from diaries, journal entries, knitting notes, documenting the row by row erosion of reason that occurs when working the Seed Stitch Pattern, especially when it is broken up into separate panels one of which is divided 9″ (23 cm) into the pattern ceasing the knitting in the round and changing it to knitting flat in rows. When prestigious knitting oeuvres describe the Seed Stitch Pattern their tone drips with condescension over its simplicity. Only a complete fool could screw it up. Two stitches: a knit and a purl make up the pattern. 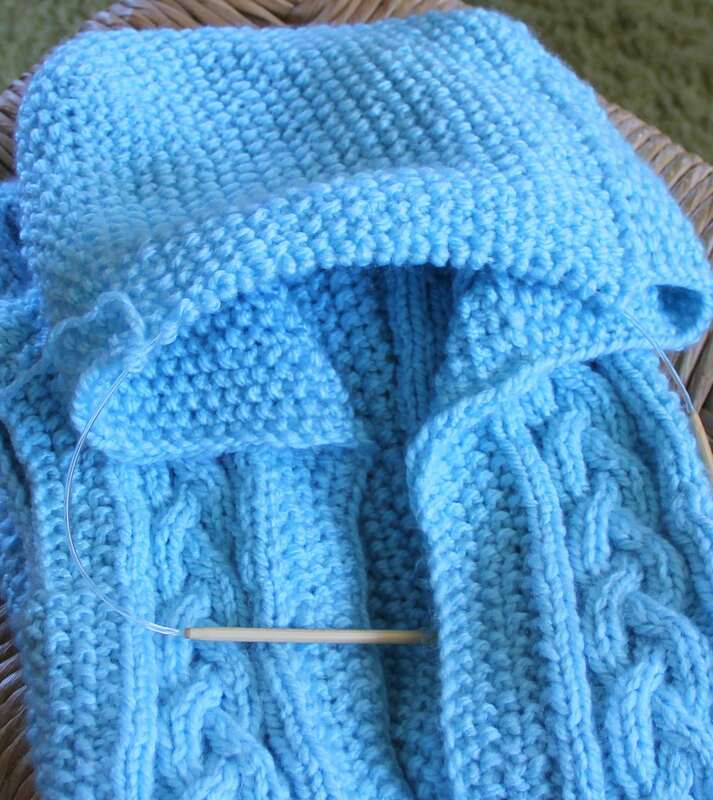 Whether I care or not about technical matters the knitting books drive home the point that technically this is a k1, p1 rib broken on every row. The unwritten point here: it’s the simplest of ribbings and if the knitter messes it up, then the knitter best look to finger painting as a hobby. The thing to keep in mind is all knit stitches are purled, all purled stitches are knit. Simple. Do the opposite of what the stitch is that’s on the needle. When I have to keep straight the 108 to 144 sts on my needles, 40 to 60 of which are separated into Seed Stitch panels of 13 sts or more and the knitting is in the round and there’s a braid whose stitches, rows, and crosses need to also be kept straight and I am not following any directions I am making it up as I go and writing it down, something is going to give. Accounting for each and every Seed Stitch on each and every row, through divisions and decreases is a little like counting grains of sand on a beach. The mind, and rightfully so, takes a hike. It comprehends the insanity inherent in the task and says, “Let me know when you come to your senses and I’ll be back.” After accounting for every seed stitch on the body of the baby carrier along with the stitches, crosses and rows on the braids, my mind said, “Adios” when I began the first sleeve. I had 43 stitches on my double pointed needles (the sleeve is worked in the round) and I only had to work 11 rows of seed stitch. Forty-three measly stitches. After finishing the 11 rows I looked at my work, because now came the tricky part, and I realized that whatever it was that I had on my dpns was not the seed st pattern. The feeling was the exact same feeling of horror I experienced the first and last time I ever went fishing as a kid. The excitement over catching a fish quickly transformed when what I pulled up was a rather large eel, not a fish. In my panic, I threw pole and the still hooked eel right into the water and ran back to the car. Of course my father retrieved the pole and set loose the eel. But that was it for me and fishing. They say good, soothing things about finger painting. I understand that it is used with success by mental health specialists in helping patients. Some paper, non-toxic paint pots…how simple. Only a fool could screw it up. Say the word gauge to knitters and after a laugh and an eye roll, they will talk about stitches. Listen politely. Ask what about row gauge and after a strange look they will say, that doesn’t matter. This is the crux of the issue with my baby carrier design. If the knitter wants to duplicate my results, row gauge is paramount or the braid design will not finish off nicely at the shoulders and neck line. How does a designer get the knitter to be as cognizant of row gauge as stitch gauge in a pattern? I could stress the importance of row gauge and provide a brief explanation supporting it in the Pattern Notes section. But really, how many of us actually pay attention to what’s written there? In the rush to start the project this section is brushed aside or skimmed over at best. I could put a blaze orange box with the words WARNING! Know Your Row Gauge! on it. This would be novel. 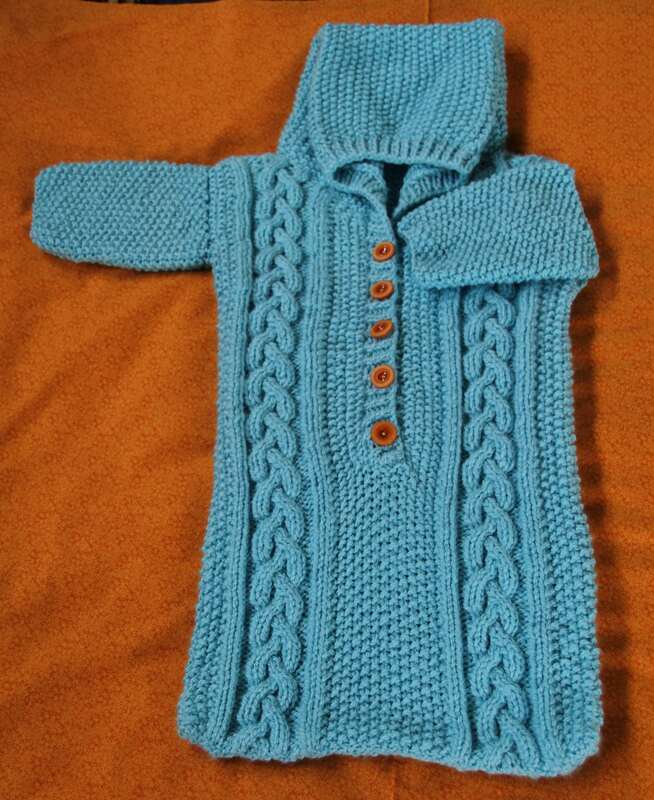 I haven’t seen anything like it in knit or crochet patterns to date. It would probably stop them for a second, but then they would brush this aside too. The only way I can figure to get knitters to pay attention to row gauge in this pattern is to give the length measurements in number of rows and make centimeters and inches secondary. The written directions are row centric. 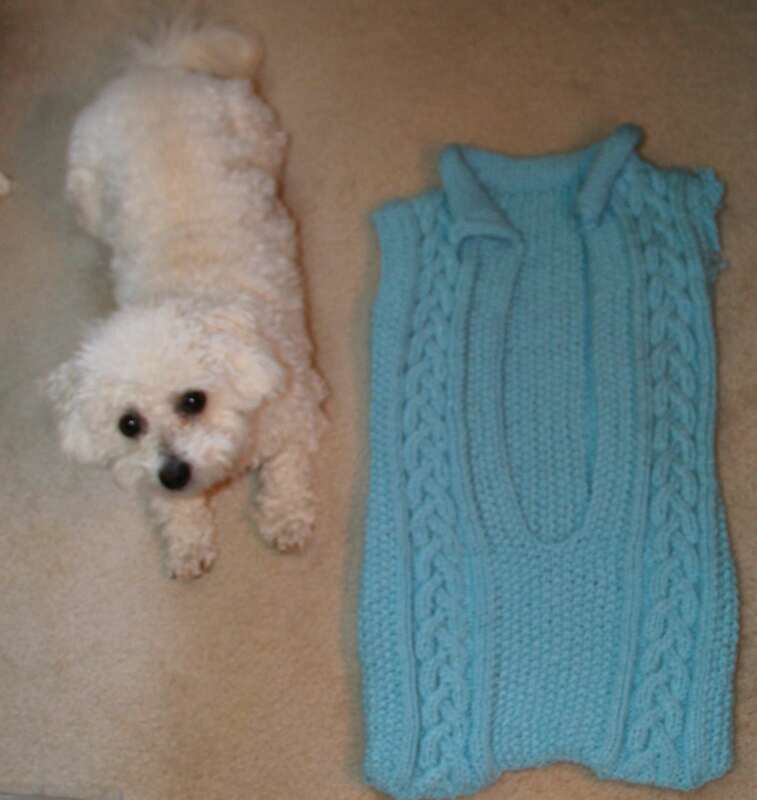 Neckline decreases begin after a specific number of rows are knit. The decreases take place on specific rows. They cease on a specific row. Dividing the front opening as well as dividing for each armhole opening begins on a specific row and finishes on a specific row. In short, I am hamstringing the knitters. Saying this takes place now, this stops now. I’ve never written a pattern in such a manner before. But it is crucial they begin and end shaping on certain rows for the braid to fit nicely at the neck and shoulders. While the body of the piece is finished, I am knitting up one of the sleeves tonight. I still need to decided whether the sleeve will be all seed stitch–my eyes cross and twitch at the thought–or whether I will center the braid on the sleeve to break up the seed stitch. Right now I can’t quite imagine the sleeve without the braid.